Disaster has struck, I awoke this morning and fired up Lister my ‘Fujitsu Siemens, Amilo’ laptop to be greeted by a blue screen and gibberish ( well it was to me ) anyway the long and the short of it is Lister has to go on a holiday to Germany to be fixed. 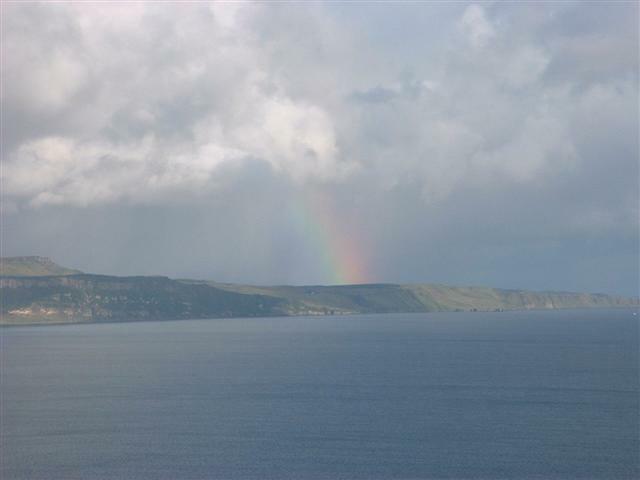 Well that’s what the man said it’s probably Bulgaria where someone without shoes will get paid washers for fixing it! Anyway as the only way I can get on line with my old clockwork IBM at home is by sitting on my bed with the mobile internet dongle hanging out of the window I am in the interests of domestic harmony going to call it a day and will be back as soon as I can sort out a modem that works! Sunday at last 🙂 I keep saying how much I love my Sundays when I’m on the ferry and today was no exception in fact it was a pure belter of an autumn Sunday. Autumn was supposed to have started 4 weeks ago and whilst we’ve had the odd sharp day and the migrating birds have been gathering together ready for the long journey south it wasn’t until today that it really felt like autumn. Having had an early night last night due in no small part to a certain Frenchman I was awake this morning with even more enthusiasm than normal and managed to catch up on the blogging I should have done last night. Going out to feed the pigs I was greeted by the roar of a red deer stag. The first of the year marking the start of the annual rut, the rut being the mating period when the stags start doing all their I’m the boss routine, fighting, rubbing trees and wallowing in mud stuff. The haunting bellow of a stag roaring on a crisp frosty night has to be heard to be believed and if you’ve never heard it before and are not expecting it it will put the fear of god in you! Hearing it however made me quite excited as they often fight and wallow nearby and are quite bold when full of hormones and not as wary of humans. This morning however there was no sign of him and I got on with the feeding. Hearing the first stag bellow is a little like hearing the first cuckoo, it’s really exciting at first but after a week or so you get peed off with it especially when they’re at it all night or rubbing themselves on the gas cylinders below your bed room window ( thankfully our garden has now been deer proof for 3 years ) I set off early for work as I was wanting to take some pics down at the new ferry terminal but kept getting distracted on the way. 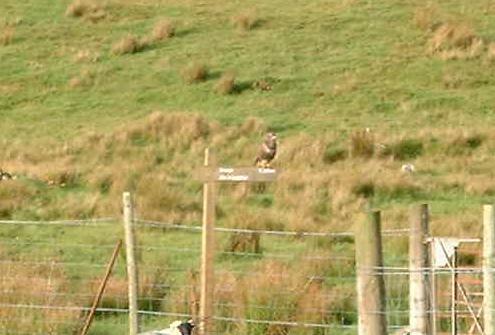 First it was this ‘rainblob’ just by Rigg over on Skye, then it was a sea eagle near Glam then this buzzard on the signpost to Inver. Followed by 2 more buzzards, the last one being just before the ferry. Having now been up for three and a half hours with nothing inside me other than black coffee I thought it was time to try out Fish’s knife on Loui’s mackeral! I’ve posted a few antlers down to my mate Fish in Somerset over the last year as he makes fantastic knives with bone/horn/antler handles. 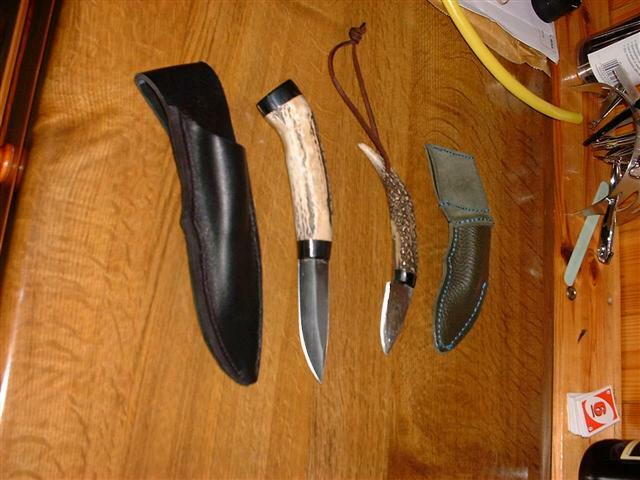 The one on the right is a Scandinavian style knife with a 2″ blade that he made for my boy last year out of a Raasay antler and an old circular saw blade. The beast on the left is another Raasay antler and arrived in the post yesterday. It was a bit of a surprise as I felt that the first knife he sent me more than paid for the antlers but it was greatfully recieved and will get well used TA MATE. Anyway it was time to try it out so I set about 2 of the mackeral that our mad Frenchman had given me. 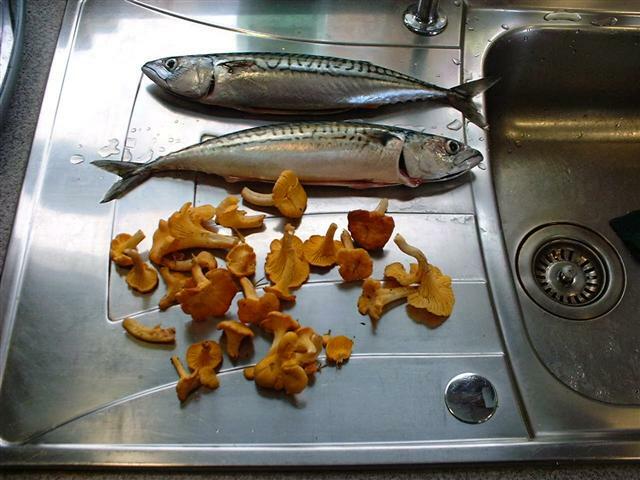 Now I’m quite sure that the cuisine on the other Cal Mac ferries is OK but it’s only on the ‘Loch Striven’ that the crew get fresh mackeral,chanterelle mushrooms and butter beans for breakfast! Ok I know it sounds a bit bizzare but It’s all we had on board. I even had to borrow some butter off one of the customers as we only had corn oil and chanterelles deserve butter. I grilled the mackeral after first splitting it down the back with Fish’s most excellent blade, The butter beans were then fried along with the shrooms in the butter and if I’d had any I would have put just a dash of soy sauce in there for no other reason than I once did it by accident and it was lovely. I seem to remember on that occaision it was butter beans fried with scallops and some of the beans exploded so if you do try this at home BE CAREFUL! I think that Fish makes knives to order and I can personnaly vouch for their quality and his integrity so if you want one he can usually be found lurking round here http://jacksshed.myfreeforum.org/index.php though it’s not really a place to visit if your vegetarian. And that’s about it really I gave the Land Rover her fortnightly wash ( I know I’m really sad ) and came home with 5 pallets in my trailer. It comes to something when you get more excited by pallets than the thought of a good night out but that’s old age for you!